An Egyptian court has sentenced seven men to life in prison for sexual assaults on women during a number of public rallies in Cairo’s iconic Tahrir Square. They are the first such heavy sentences against perpetrators of sexual violence following the government’s decision to toughen penalties. 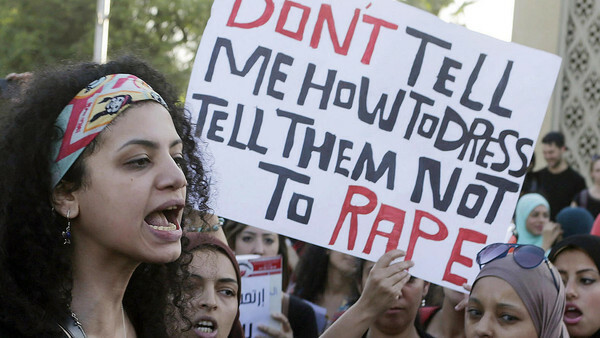 Sexual violence has been on the rise in Egypt, particularly during public gatherings in the past three years. The charges stemmed from four different incidents of sexual assault, including one during celebrations of the inauguration of President Abdel-Fattah el-Sissi in June. In a nationally televised session Wednesday, the judge sentenced the eight men to life in prison. Three of them received multiple life sentences for taking part in different assaults. Two other men got 20-year sentences.